This is obviously not a fundraiser that will work for most groups but it could be adapted to a number of different causes. the wheelchairs went to Brian Bickett, the New Mexico representative for Joni and Friends. 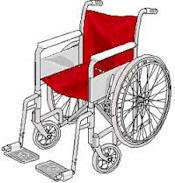 The nonprofit organization supports people with disabilities. Bickett said he is kicking off the state’s first Wheelchair Roundup. To get people’s attention, Bickett got permission from the owner of Shell to prop more than a dozen wheelchairs up along the edge of the business. “It’s a great location,” Bickett said. “I can already tell I got a couple of donations.” When Bickett arrived to check on the line of wheelchairs Monday, he found several wheelchairs that had been dropped off. “We just have maybe 30 or 40 now, but we’re hoping to get 1,000,” Bickett said. The collected chairs will head to southern New Mexico to the Corrections Department. Bickett said each part of the wheelchairs will go to a state prison, where inmates will refurbish everything. At that point they’ll be donated to people around the world.